← Bichos Argentinos #11 – I’m out’a here! This species is native to tropical Asia, but is commonly cultivated in warm regions of the world. A number of cultivars and hybrids involving related species are sold, so it’s hard to be sure which one you photographed. The most common cultivar seems to be cv. ‘Tara’ and that’s a possibility for your plant. 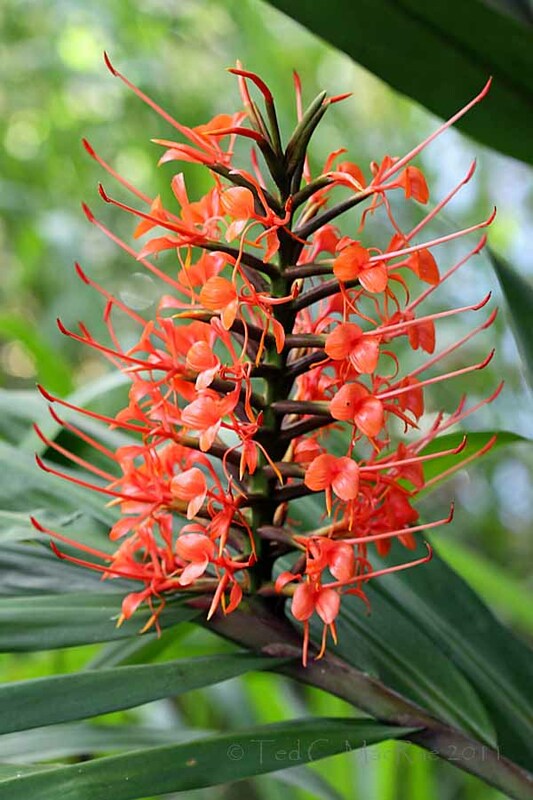 Known by a number of common names (red gingerlilly, orange gingerlily, scarlet gingerlily, orange bottlebrush ginger, etc. 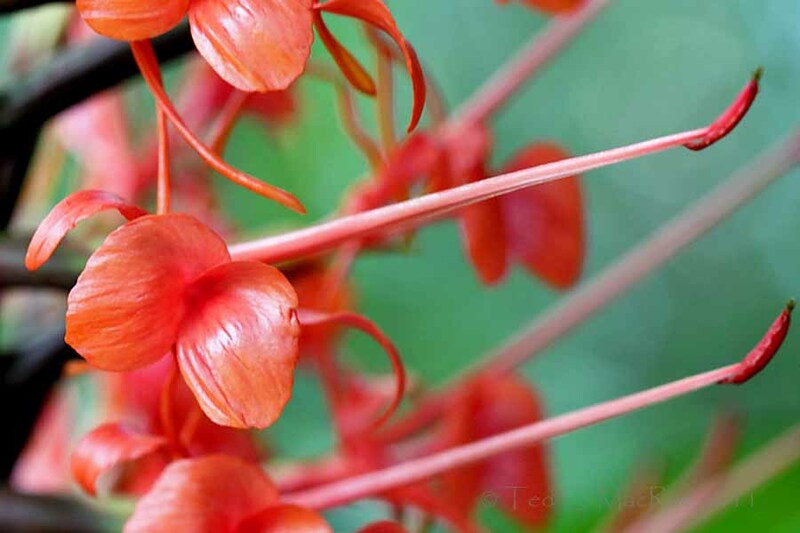 ), H. coccineum hails from the eastern Himalyas, where it grows along forest edges and in mountain grasslands. This herbaceous perennial can reach one to two metres in height and, in some places, has become somewhat invasive. The existence of rhizomes and bulbs can make control particularly difficult. An interesting feature of the plant is the long, exserted stamens and stigmas of the flowers. This feature is suggestive of an interesting pollination mechanism that relies on pollen attachment to the wings rather than the main body of its moth and butterfly pollinators. Pollen transfer is effected as the lepidopterans move from flower to flower seeking nectar, brushing their wings against the floral parts in the process and thus pollinating the flowers (Zomlefer 1994). Zomlefer, W. B. 1994. Guide to flowering plant families. University of North Carolina Press, Chapel Hill, 430 pp. This entry was posted in Zingiberaceae and tagged Botany, Brazil, exotics, nature, pollination, science, wildflowers. Bookmark the permalink. I got a few strange looks from folks when I got out the camera pack and geared up – including from my colleague’s friends! -rr-, initial r-, and sometimes final -r, developed into an H-like sound in some (but not all) dialects. You would als be perfectly understood if you pronounced it as a rolled R, as in Spanish, since to Brazilian these are equivalent (just as, say Z- and TH- are to a French speaker). A mtata atlantica — legal mesmo! It’s funny, because I’m learning Portuguese phonetically rather than from a book – opposite from how I learned Spanish!